Having a Master's in Communications/Journalism and a BS in Fashion Merchandising, I tend to look at the media with different eyes than the rest of the world and the one thing that I have always wanted to do and am working towards is one day having a publication that celebrates ALL manners of beauty. Not just what we see in America. Because of a lack of visible diverse beauty in the media, I have decided to celebrate it here every Monday on this blog in the manner of Beauty of the Week/Pink Plaid Ladies (a movement I am starting to promote healthy and diverse beauty images). I wanted to do this because I know what it feels like to grow up and not see 'yourself' reflected in the faces that you see in the magazines and on TV. I want to show the ladies and gents that read my blog that beauty comes in all shades and shapes and nationalities and hopefully encourage you all to accept your beautiful selves for who you are naturally. Eventually I will include pictures and profiles of real live people that I know, but for now I will use public figures. 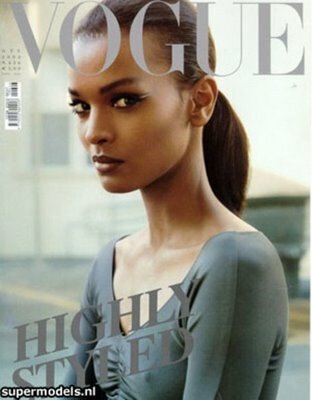 This week's beauty of the week is Ethiopian Supermodel Liya Kebede. Liya has an impressive resume for which she is the first woman of color to be the spokesmodel for Estee Lauder. Her mocha skin has graced the covers of many international publications. She is not only beautiful but talented. She created LemLem, a Clothing Line that features hand-spun, woven and embroidered women and children’s clothing. The word means "to bloom" in Amharic and was created to perserve the art of traditional weave making in Ethiopia(1). She is also a WHO Goodwill Ambassador for Maternal, Newborn and Child Health. Whatever she is doing she is always gorgeous doing it. 1 comment on "Beauty of the Week-- Liya Kebede"